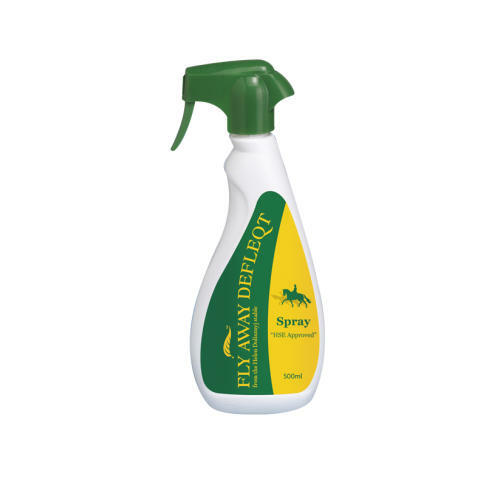 This powerful and effective natural formula ensures your horse is protected from all flying and biting insects. Contains citronella oil. Improves coat condition and shine. Suitable for all exposed areas of coat invisible upon application and does not stain. HSE approved as safe and effective. Contains no listed FEI banned substances. Safe for you your horse and the environment. Spend £35 or more and we'll deliver it to you, absolutely FREE! Sign up to our mailing today! We're busy picking and packing to get your items to you as quickly as possible. You may receive emails regarding the submission. Any emails will include the ability to opt-out of future communications. Please respond to all the statements - if you're unable to agree to any of the below, please give us a call on 0113 277 0634. My pet is not on any other medication. My pet is over 12 weeks of age and is not pregnant. My pet is in good health. I am over 18 and able to administer this product. I will read the instructions in full before its use. My pet is the appropriate weight for this product. If you’re unable to agree to any of the above, please give us a call on 0113 277 0634. We do this to meet VMR* guidelines, in place to keep your pet healthy. My pet has been examined by a vet who recommended we use [name]. I understand that I need to check with my vet every 6 months to confirm that [name], is still the recommended food for my pet. If my pet's condition becomes worse whilst I'm feeding [name], I'll ensure we visit the vet to get proper advice. What would you like your tag to say? Nature's Menu frozen raw pet food will be delivered by our trusted supply partner separately to any other items in your order in order to ensure your food stays frosty all the way to your door. Frozen delivery is free for all orders over £35 but will be charged at £5.95 for all orders below £35. You will receive a separate email from Nature's Menu confirming delivery details within 24 hours (Monday to Friday) of placing your order.